After much searching, we have found a new home. Due to expansion of Federal Blvd., we are losing our entire front parking lot. To maintain an environment of safety and convenience, we have to change locations. That’s the not-so-great news. 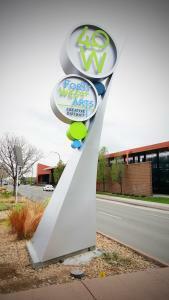 40 West is one of the fastest growing art districts, and we will be proud to call it home. We are eager to start a new chapter in a city that fully supports the creative arts, and in an art district that is rapidly growing its ranks. The historic building, located at 8000 West Colfax Ave., was once the Lakewood Movie Theater. Listed in the Film Daily Yearbook of 1951 as seating 900. The Lakewood Theater was still open in 1955, but had closed by 1956. Eventually the theater housed a Volkswagen dealership, a furniture store, Yamaha motorcycles, then Harley Davidson motorcycles. We’re excited to bring the vibe of visual creativity back to this building. As of the date of this post, the Harley Davidson dealership still resides in our soon-to-be-new location at 8000 West Colfax, Lakewood, CO while the finishing touches are being applied to their new building in Golden, Colorado. We cannot begin our tenant improvements until the HD dealership vacates, and city permits for our changes are taking time. We’ll broadcast our grand-opening date as soon as we have it locked-in. Stay tuned by subscribing to our newsletter and following us on our social channels.